Magnificent, large scale, handmade artisan, estate chandelier features a bold zebra patterned, crackle finish, large round translucent domed bowl. Chandelier frame is a patinated bronze and verdigris brass. It is topped with a repeating motif of African animal sculptures of elephants, monkeys, giraffes and lions, which pose atop a wide shade band with high relief crocodiles. It is crowned with an extravagantly large, tapering palm frond top with a twisting branch. 8 light candelabra has branching arms and handmade leather shades with mottled gold and black interiors. Chandelier dome is accented by a large acorn finial in the center. Perfect for a great room or man cave! Measures 48" in diameter x 56" high. Weighs 246 pounds. Patina and bowl have some surface scuffs. 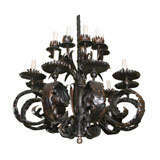 A French patinated bronze chandelier with 12 trumpets shaped arms, circa 1940. Original patina. Measures: Height 26 inches. Diameter 38 inches. Number of items: One. 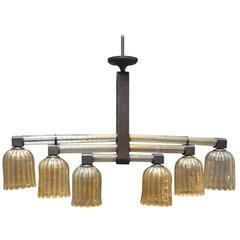 Chandelier found in Belgium with patinated brass frame and eight candle style lights, circa 1930s. Chandelier has been rewired for US electrical standards. A French bronze chandelier with original patina and 6 lights, circa 1920s. Measurements: Height 50" Diameter 34". A Dutch chandelier with original patina and eight lights, circa 1900. Murano glass and patinated bronze chandelier. Murano glass has gold flecks blown into it.